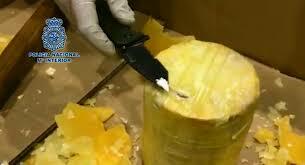 Hundreds of kilograms of cocaine has been found concealed within pineapple shipped from South America. A joint operation between Spanish and Portuguese police resulted in the seizure of 745kg of the drug. The 10-month investigation led to nine arrests and broke up an international smuggling ring led by Colombians. Police in Portugal and Spain said they seized hundreds of kilograms of cocaine hidden inside fresh pineapples, and arrested nine members of a gang that had transported the drug from South America. Police in Portugal and Spain have seized 745kg of cocaine hidden inside wax cylinders within fresh pineapples being shipped from South America.